Riding a bike seems simple for those who can, while those who can’t shy away from publicly admitting they don’t know how. Riders and non-riders forget that there was a beginning to the learning process and that what they know now was acquired from a series of trials and errors without much guidance beyond those early pushes from a comforting hand. Often the process of formally learning how to ride a bike ends after you can pedal to the furthest points of the driveway and return in one piece. These days I mostly work with people who already know how to ride. These are riders, commuters, and racers who realize that the learning process can continue in order to gain control and confidence, and that safety and speed are not two intrinsically opposed skills. We often learn to ride at a young age after an adult armed with reassuring hugs and bandages has set aside the time to be with us through the many spills the process might require. Let’s assume that most of us began to ride before the age of ten, that mysterious first decade where most memories revolve around a few momentous occasions and the daily task of learning to ride is long forgotten. As soon as the hand on the back or the training wheels come off and we’ve proven ourselves able to pedal, coast, and come to a stop, we’re generally unleashed to figure out the rest of the details. While we are exploring a greater radius from home we begin forming habits born from repetition. We compensate for scary spills, and repeat techniques that reward us. As we get older and develop layers of emotional and physical protection from failure it becomes harder to try things that risk bruising our egos and flesh. Bad habits are formed that help us feel safe in our zone of protection but limit us from experiencing new things outside of that zone. Sometimes that zone is built with bad habits on the bike, and sometimes it means avoiding the bike completely. 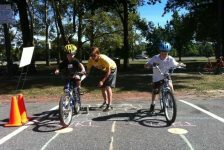 While many of us wouldn’t balk at the idea of someone searching out a golf pro or a tennis coach to help them with technique, just the concept of getting someone to teach you how to ride your bike better sounds a little embarrassing if you are over the age of 12. 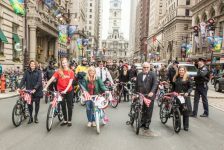 But, improving the skill set for riding in a city, the woods, or even a rails-to-trail can make the experience of being on a bike safer and inspire one to go further, explore more, and make the bike a utilitarian tool for living. Looking over the shoulder to check for traffic while riding a straight line is one of those little skills that can be crucial to riding safely in traffic, and basic concepts of center of balance and bracing against breaking forces can help you avoid a sudden collision while putting a foot down calmly even when the heart is racing. The skills we formed growing up are generally self-taught and allow us to be functional on the bike for our need at the time but the current rise in popularity of cycling as an alternative mode of transportation is creating a need for a new set of bike skills. In order to be a safer vehicle on the road are you able to take a hand off the bars for signalling direction change? Do you get nervous around cars or when passing and getting past by cyclists? Can you look over your shoulder while riding and maintain a straight path? Do changes in the surface of the road make you tense, or when starting at a light do you scoot along awkwardly trying to get momentum in order to stay upright? Some people who have taught themselves these things will scoff, but many people don’t realize there are safer ways to do many of the things they do every time they ride a bike. It’s important to remember that you’re never too old to learn, but it’s equally important to realize that convention does not have to dictate what we know. The amazing thing is that many of these awkward or dangerous lapses in skill are easily corrected but no one ever took the time to show us how to do it. A recreational cyclist who rides in groups has the advantage of being around other riders and can pick up tricks from those riders by being told what to do or through observation, but, many of us don’t aspire to ride with groups, we just want to take a Sunday trip along the river, get to the grocery store or make it to work. It’s important to remember that you’re never too old to learn, but it’s equally important to realize that convention doesn’t have to dictate what we know. Cycling is hitting a golden dawn in this country and the old ways of doing things are ready to be revised and updated. It used to be perceived that cycling after getting a drivers license was reserved for athletes, hippies, and DUI cases. Or, it was a sign of lacking the wealth to make monthly payments or upkeep. The times are changing and the cultural acceptance of riding for other reasons is broadening. Without less concerns about social stigma and lack of infrastructure keeping people from riding to and fro, the last real road block for many is knowledge, comfort, and skill. If you want to ride in a straight line while looking over your shoulder there are a few key points to think about for this skill. Stay relaxed, maintain speed, and coast. Relax because when you look over your shoulder you don’t want your arms to follow your head or else the bike will want to turn. To help separate the head and the arms, breathe out as you look over the shoulder. Speed is important because the slower you go the harder it can be to hold your line without momentum on your side. Looking over the shoulder while pedaling is harder than when coasting so start with the easier way first. The more you practice, the longer you’ll be able to hold your over-the-shoulder look while staying on your path. To practice this at home or work sit in front of a table or desk about the distance you would be from the handlebars while on your bike seat. Put both hands on the edge of the table about handlebar-width apart with your fingers on top and your thumbs underneath. Now try to look over your shoulder without letting either hand increase pressure into the desk. How light can you keep your hands while getting a good look back? If you are on your bike and you increase pressure in one hand the bike is going to want to deviate from it’s path. A left look wants to make the right hand press in.